Lagartun Carded Flat Braid is in the Caddis Fly Shop and will ship promptly with NO Sales TAX, and Free shipping on most Domestic USA orders. This is a sweet material that will allow you to tie superior salmon, steelhead, and trout flies. This is the widest of the Lagartun Braids, has great color options, can be wound on as body or rib with very little added bulk, and is simply a must have material for the serious artisans in our clan. 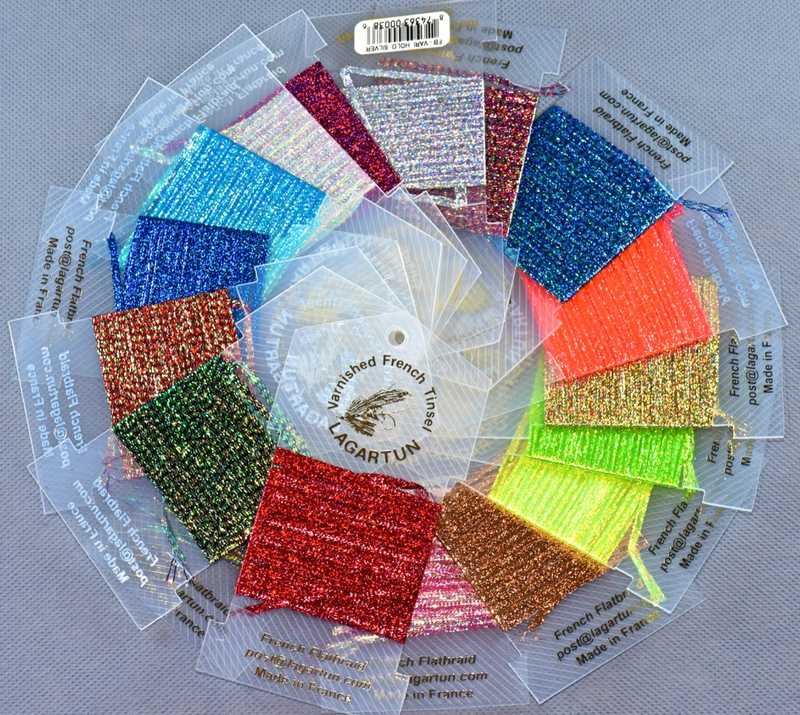 Discriminating fly tyers have anticipated the return of superior Lagartun products to the US and we are excited to announce that we are now offering a variety of these products in our Eugene Oregon Shop and though our Internet Catalog. .
Why purchase your Lagartun Products from the Caddis Fly Shop? Start with the unsurpassed quality of Lagartun, the range of products we offer, and then factor in our complete one source shopping experience with first class customer service. As if that were not enough, add in our NO TAX and FREE SHIPPING on most domestic USA shipping. Appropriate uses for this Flat Braid? We have used this material for bodies on salmon, steelhead, and trout flies. The colors are fantastic, and the material is super tough in spite of being super thin. Even though this carded flat braid is the widest offered, We have used this braid as body on hooks from size10 through Intruders that are over four inches long. Of course the Mini Flat Braid and Micro Flat Braid is superior when making bodies and ribs on smaller sized hooks. How is Lagartun Carded Flat Braid different? Very thin. At about 0.100mm. Wide enough At 1/8 inch this braid will cover steelhead and salmon flies as complete bodies or allow you to create a prominent, wide rib. The material? Carded Flat Braid is "Metaloplastic", which is not quite metal but it is darn tough plastic material that is reflective, a little translucent in some colors, and lays flat as can be imagined. Practically anyway. It does lay flatter than traditional Flat Diamond Braid. The Quantity per card? Five yards! How many colors do we stock? 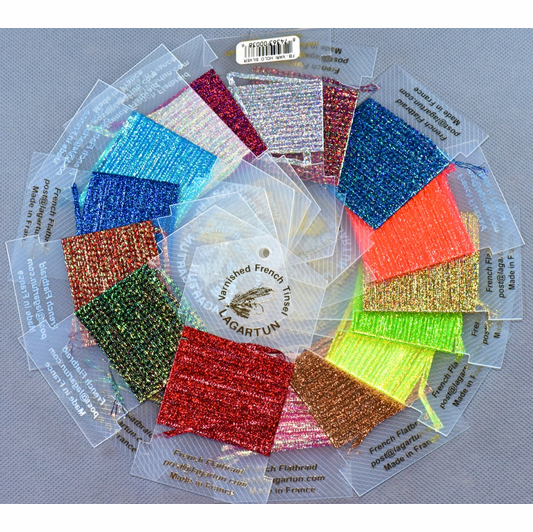 We have ordered in roughly 20 colors of the Lagartun Carded Flat Braid.